Listed as a “Type 3” treatment for a Bicycle Friendly Street, loop detector symbols sit dead center in the range of street treatments. While we’ll go into the specifics of how loop detector symbols can be utilized in a Bicycle Friendly Street, we should first cover what loop detectors are and how they work. Loop detectors are coils of wire set into the pavement which, after they are electromagnetically triggered, alert traffic lights to change in the direction you are traveling. There’s a good amount of the hard science on the subject, which you can read more about here. The takeaway is this: putting your bicycle over a loop detector should make the light change faster. Interestingly, it’s not the weight of the bicycle that trips the loop detector, it’s the metal in your bicycle interacting with the electricity running through the loop detector. This does mean, unfortunately, that carbon-fiber bicycles may not have enough metal to set off loop detectors. Since 2007, California state law (with the passage of AB 1581) requires all new loop detectors to be sensitive enough to pick up bicycles. Bicycle detection at intersections is also now part of the CA MUTCD, contained in Part 4 (pages 67-68 & 88-90) and Part 9 (pages 32 & 44). The City of Los Angeles currently uses circular loop detectors, the one in the top left of the graphic. The best place to put your bike at an intersection is directly over the right or left edge of the loop. Because circular loops are the least effective at picking up bicycles, the LADOT Traffic Signal Design Guidelines also call for a diagonal stripe to be put through all loop detectors adjacent to the “limit line” (the edge of the intersection) in order to better detect bicycles. Check out page 8 in the pdf linked above for a good example. 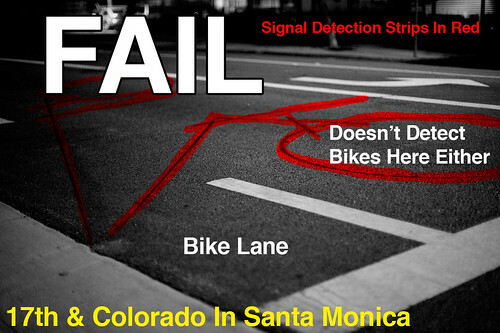 The City of Los Angeles also has loop detectors specifically built for bicycles. 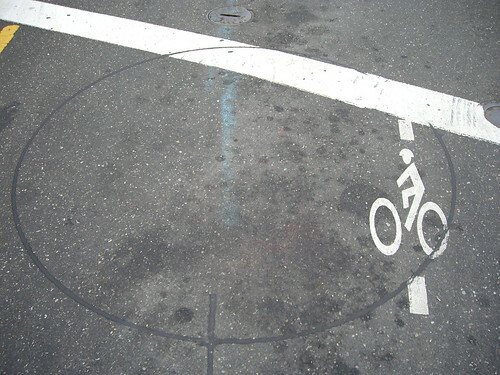 These typically are installed on bike lanes and resemble a smaller version of the “Square Loop” shown above. There aren’t many things more annoying than rolling your bike onto a loop detector and getting no response from the light. If you come across any broken loop detectors, please report them to LADOT and we’ll come out and fix or adjust them. The length of time between signal changes once a loop detector is activated can greatly vary by intersection, so please be extra certain the loop in question isn’t functioning before reporting it. The proper place to report a non-functioning loop detector is with your LADOT District Office. How do you know what district office jurisdiction you’re in? They roughly correspond to the Council Districts. So how does this all apply to Bicycle Friendly Streets? Well, the Technical Design Handbook calls for specialized stencils (page 44) to be painted over loop detectors on roadways receiving “Type 3” or higher treatments as Bicycle Friendly Streets. Combined with signal priority along the Bicycle Friendly Street, converting problematic 4-way stop intersections into signaled intersections, and installation of street-facing push buttons, stenciled loop detectors built for bicycles help turn a street into a Bicycle Friendly Street. One important note, the law isn’t specific to loop detectors. Other means such as video cameras with software able to detect bicycles can also be used (which can also make the act of counting bicyclists for planning purposes much more efficient/cheaper). Of course, the loop detectors are already in place, and if they can be tweaked to detect bikes, then that is cheapest of all. Hopefully everyone at LADOT bikeways will take a look at and discuss the new Streetsfilm by Clarence Eckerson Jr entitled Portland’s Bike Boulevards Become Neighborhood Greenways http://www.streetfilms.org/portlands-bike-boulevards-become-neighborhood-greenways/#more-48659. Except for the odd way of using Sharrows signage it looks like most of these treatments could be used in Los Angeles. Wouldn’t it be great to commonly see whole families riding down streets together? That is a sure sign that bicycle infrastructure gives a sense of safety to all users. The use of road signs that give direction to where the highlights are on the main arterials are extremely important to make these side streets valuable to even the experienced cyclists. Without them the neighborhood friendly streets will not get as much support from the fearless bicycle riders. Fast, easy to get where you need to go and a feeling of safety are all vital to great a large increase in bicycling modal share. Street-facing push buttons are not an acceptable alternative to in-street loop detectors. They invariably require the bicyclist to hug the curb to reach the button in exactly the place where staying away from the right curb is critical (intersections). Cyclists near the right curb are at serious risk for being right hooked. Cars wishing to turn right will line up to the left of the through-traveling bicyclist, setting up an unnecessary conflict point. Even worse is when cities place the bike push buttons to the right of a right turn lane. I hope that these push buttons are an illustration of what NOT to do rather than a feature on bike friendly streets. Agreed, Eric. Street-facing push buttons are only really useful at intersections where no right turn is allowed on red. Since this is California, there aren’t many intersections like that. A recent post on diversions reminds me that there is a real call for a demonstration project in Los Angeles to roll out some of the innovations mentioned here, least being loop detectors that work and stenciled guides. Great ideas too, but let’s think bigger and better. Rolling out a plan for an intersection featuring separated bike circulation with integrated signaling would be a great complement to the adopted bike plan (perhaps in December). 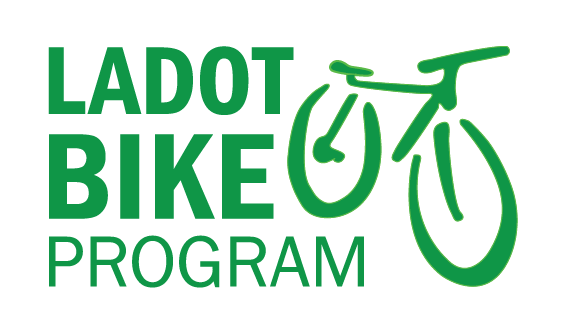 Getting the Bike Plan adopted will go a long way towards achieving that goal. When we can point to those treatments in the Technical Design Manual, we can become eligible for using federal and state funds for the project. 2010 Draft Bike Plan as a replacement for Bike Boulevards.